America Achieves Educator Networks collaborates with schools across the nation and the globe to learn about, advance, and share promising practices to improve career readiness and life success. The Future Class Network Learning Lab (FCN), one of our world-leading learner schools, recently connected with the Educator Networks to discuss how it uses project-based learning as a practice to prepare students for life beyond the classroom. Project-based learning is structured in a way that develops student agency and the cross-sector competencies that are part of the school’s broader vision. Project-based learning is designed to be interdisciplinary, allowing for deeper integration. Project-based learning includes a deliberate feedback process, which is valuable in helping students develop cross-sector competencies. We hope this school profile serves as a useful resource as schools develop and implement their own PBL programs in service of career readiness. The Future Class Network Learning Lab, founded in 2017, is the innovation hub of the Future Class Network, an educational, nonprofit organization located in South Korea. The Future Class Network is committed to linking education to societal and economic changes. By fostering teacher collaboration and developing initiatives like school-wide project-based learning, flipped classrooms, and local industry partnerships, FCN strives to create a new vision of 21st century learning. By hiring teachers that are creative and cutting-edge, the FCN Learning Lab purposefully supports their educators in sharing their best practices with other schools with the goal of supporting more schools to take a future-oriented and youth-driven approach to education. Through the sharing of best practices, their aim is to drive student agency and 21st century learning in schools throughout Korea and across the globe. The vision of the FCN Learning Lab is to foster the best education possible for the 21st century. To this end, the school empowers students to be agents of their own learning and helps students develop collaborative, real-world problem-solving skills. When the FCN Learning Lab launched, it had 12 students and six teachers. 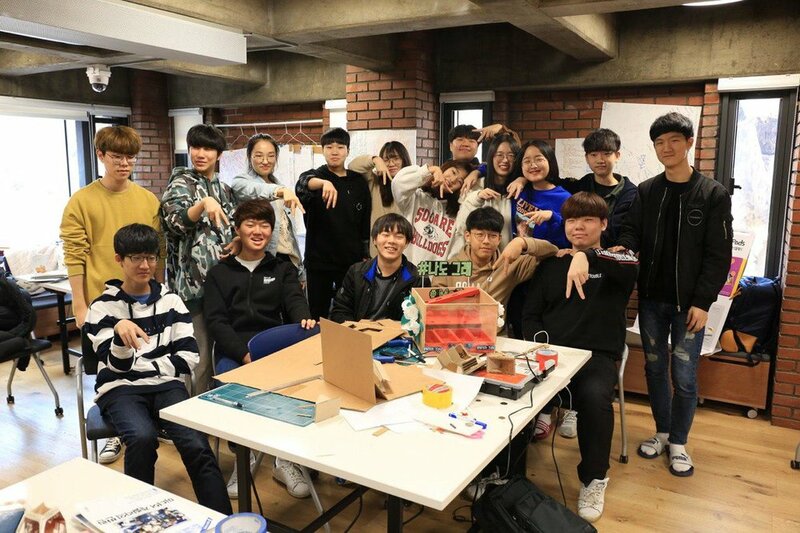 In 2018, the school expanded to 40 students from all over South Korea and formed its own research team to study the school’s impact. It is a non-year system; students who range in ages from 14 to 19 years old can stay to continue their learning and work at their own pace. As part of its educational model for “21st century learning in a globally connected economy,” the school focuses on developing key student competencies—Creativity, Cognitive Empathy, Collaboration, Communication, and Critical Thinking (the 5Cs)—based off of P21’s Framework for 21st Century Learning. 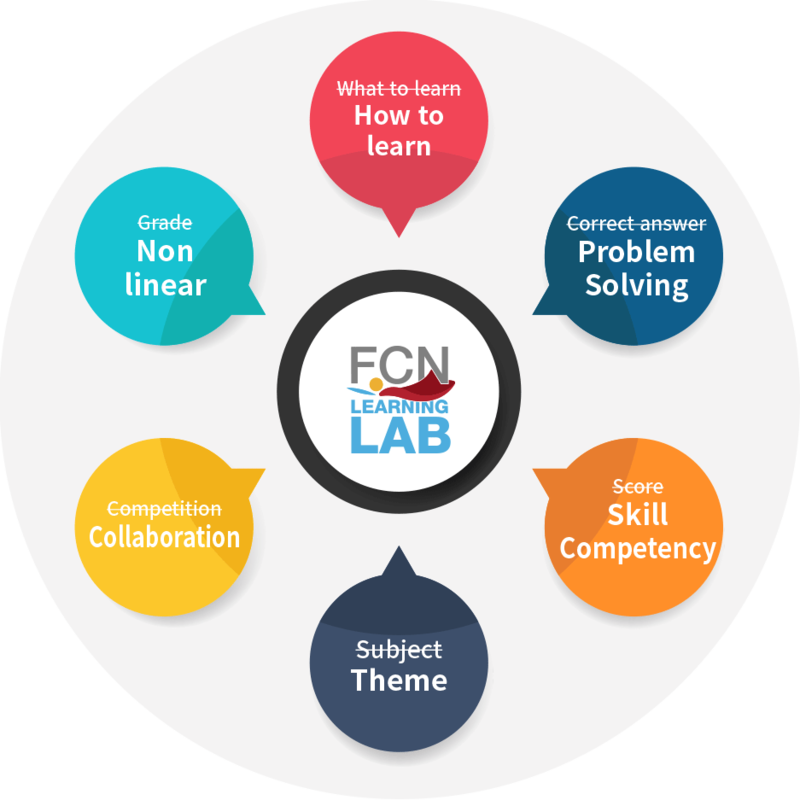 The FCN Learning Lab uses a flipped classroom model; hands-on, student-guided activities; real-world, relevant projects selected by students; and a continuous peer and teacher feedback and self-reflection model to support students in developing these competencies. In addition to being on a non-year system, the FCN Learning Lab also operates as an alternative school model based around the Keokuro Class Project and the World’s Biggest Class Project, a model of Project-Based Learning (elaborated on below). According to a study from the Achievement Gap Initiative at Harvard University, student agency is “the capacity and propensity to take purposeful initiative—the opposite of helplessness. Young people with high levels of agency do not respond passively to their circumstances; they tend to seek meaning and act with purpose to achieve the conditions they desire in their own and others’ lives” (p. 1). The FCN Learning Lab aims to advance student agency through a vision of collaborative real-world problem-solving that goes beyond the classroom. The Keokuro Class Project approach is used to develop both students’ agency and the 5Cs (Creativity, Cognitive Empathy, Collaboration, Communication, and Critical Thinking). The Keokuro Class Project is a “collaborative peer learning environment [specially tailored to the Korean system] where students use various learning methods including flipped learning.” In this model, traditional lecture-style classrooms are replaced with hands-on, student-guided activities aimed to promote and support the development of 21st century competencies. Students develop core subject knowledge through online computer programs and videos and build agency through the flipped classroom model, where they have the opportunity to take the lead in their learning and partake in hands-on activities. One of the goals is that students work in teams, learning to communicate effectively while also learning to think critically and develop creativity. Through this model, students also gain the foundational skills needed to be more deeply engaged in project-based learning. The second instructional model used by FCN Learning Lab that supports student agency and cross-sector competency development is the World’s Biggest Class Project. The World’s Biggest Class Project was created with “the aim of empowering students to utilize their academic knowledge in problem-solving skills.” Students are tasked with real, relevant problems to solve. This model is informed by Ashoka Changemakers, the concept that anyone can take action to solve a problem in their community, and Stanford d.school’s design thinking. The school reports that students show deeper life satisfaction and academic motivation as a result of this type of authentic project-based learning. The school’s curriculum is designed around real-world problem solving through “convergence education”—module-based learning where a particular topic is focused on as an instructional unit while also integrating other subjects. Each subject is taught in connection with other subjects. For example, math and foreign language are incorporated into history classes. Students apply subject knowledge to their projects, adding in real-world relevance. By integrating multiple subjects in each unit as well as creating projects that require the application of more than one academic subject, students employ some, or all, of the 5Cs. The flipped classroom model and school-wide focus on project-based learning support this multidisciplinary approach. The FCN Learning Lab ensures the authenticity of PBL by requiring students to identify real-world problems specific to their communities. Students must also determine the process to solve these problems. They can use facilities at a partner university or a makerspace, as well as connect with local industries that have built relationships with the school. Through these partnerships, students are supported in developing prototypes and exploring solutions. Students have completed projects such as turning an unused parking lot into a community playground, creating a sensor to reduce the wait time in lunch lines, and developing and implementing additional safety features for pedestrian crosswalks. The FCN Learning Lab believes that students already have the inner power and potential to achieve great things—they just need autonomy and opportunities to take responsibility of this learning. (Note, in US-based PBL models, these are often referred to as student choice and voice and sustained inquiry.) The school posits that when students believe they are trusted, especially by their teachers and peers, that feeling is powerful and can positively impact their future endeavors. At the FCN Learning Lab, every student is required to write in their learning journal daily. This activity helps students to reflect and better understand themselves as learners, emphasizing the development of metacognitive skills. Teachers play the role of coach; they check students’ learning processes, give constructive and regular feedback, and help students stay inspired and motivated. Students have an opportunity each month to reflect on and revise their work with the support of peers and teachers through the school’s learning fair. Before each monthly fair, students are supported as they analyze their learning over the past month and identify what they have not yet mastered. They are able to re-do or revise their work as needed in preparation for the fair. (Public work products are central to several PBL models.) Students practice revision strategies, self-evaluation, and peer-evaluation as they work to master core content. During the fair itself, students invite their families and friends and explain their work and accomplishments. This process provides students with supportive feedback, practice with the 5Cs, and opportunities to observe their peers’ learning strategies. Where PBL is designed to meet specific learning goals, not just engage students in interesting projects, it’s important to be able to measure students’ development of cross-sector competencies and other targeted knowledge and skills. At FCN Learning Lab, an in-house team of researchers determines how students are developing the 5Cs. From August 2017 to January 2018, the FCN Learning Lab conducted research on the impact of their learning model. The school found that the students are reconstructing the meaning of learning and understanding how failure can be a chance to learn and grow. Additionally, they found that students showed growth in creativity, critical thinking, collaboration, communication, learner autonomy, and discovering self-identification for career learning and life-long study. - Changing teachers’ mindsets to foster buy-in is an initial step to successfully launching PBL. It is not enough to only focus on the technical elements of implementing PBL, nor is it enough to rely solely on knowledge acquisition. The rationale (the why) for the work must clear and there needs to be sincere belief and trust in the process by all involved. -Just as students need to learn cooperation and collaboration skills, many teachers also need learn to work together on PBL initiatives. If school-wide PBL integration is a new initiative, unfamiliar problems may arise, as might conflicts and confusion. Educators need to support one another and build a deep trust in the process. Strong relationships must exist between all educators at a school, as well as between the educators and the students. -Community and teacher support need to be emphasized. Within this model the teacher role changes from that of an expert delivering content to a multifaceted profession: mentor, counselor, and facilitator who helps students make use of what they learn in real-world problem-solving. The FCN Learning Lab strives to ensure teachers feel supported in this mission by focusing on community-building and teacher collaboration. -It is important to acknowledge that students learn at different paces; projects might not proceed at the same pace. Educators need to be able to support students to investigate and solve problems with independence and authenticity, including leveraging learning opportunities and resources outside of the school day, means different kinds of support, timelines, and products. -Effective PBL does not only happen within a school but also at home, in the community, and/or in collaboration with local businesses, higher education, and other organizations. These outside opportunities allow students to explore and learn at their own pace while also working toward the success of their project. Real-world experiences are critical.